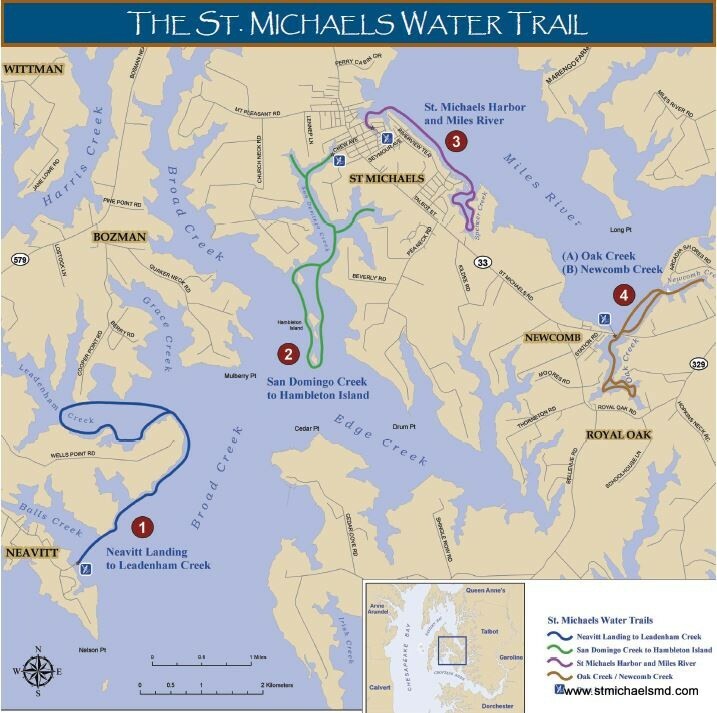 There are four suggested paddling routes around and near St. Michaels; San Domingo Creek, Oak Creek, Miles River and Leadenham Creek. The trails are not marked and demand a certain level of skill and caution. Paddlers should be aware of the weather forecast, wind direction, wind speed, tides, boat traffic and water temperature before undertaking any of the trails. Please stay clear of all commercial boat traffic while paddling. The sights you see and experiences you may enjoy vary depending on the season. Kayaks and Paddleboards can be rented at Shore Paddle and Pedal at www.shorepedalandpaddle.com (410) 745-2320. Trail descriptions and Maps are courtesy of The Talbot County Office of Tourism. Directions to launch site: From St. Michaels take Route 33 toward Tilghman Island for about 2 miles. Turn left on Neavitt Road toward Bozman. Continue on Neavitt Road for about 6 miles through the villages of Bozman and Neavitt, to the launch site on Neavitt Road. Put-in is the boat ramp. Hard put-in. Attractions: If the water clarity allows, you will see an abundance of submerged grasses along the natural shoreline. The Sanctuary is a 950 acre estate donated in 1997 by Jean Ellen Dupont Shehan to the Audubon Society. It remains largely undeveloped and provides the paddler with a glimpse of native Chesapeake Bay vegetation. Nearly 200 bird species frequent the Sanctuary during the year. Skill level: Intermediate to difficult, open waters with SW exposure. Cautions: Be aware of tidal currents. Waves 1-2 feet or higher in strong winds. Return trip can be against SW winds, especially in summer. Check local weather for wind direction and speed. From boat ramp head east across creek to northern shore (left). Follow shoreline keeping it on your left. There is one cove before Leadenham Creek you may want to explore. The entire shoreline is part of the Jean Ellen DuPont Shehan Audubon Sanctuary. Follow shoreline into Leadenham Creek to left at green channel marker #1. Paddle west (left) up Leadenham Creek about 2 miles. 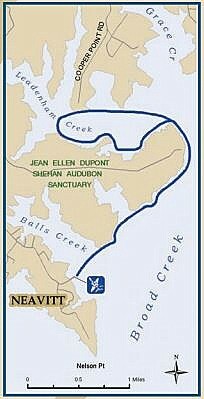 Turn around and retrace your path back to Neavitt boat ramp, keeping the shoreline on your right. Directions to launch site: From Route 33 in St. Michaels take W. Chew Avenue and proceed 2 blocks to harbor on left. Put-in is to the right of the boat launch and dock in the park. Soft put-in. Skill level: Beginner to Intermediate, some open waters with SW exposure. Cautions: Be aware of tidal currents. Waves 1 foot or higher in strong SW winds around Hambleton Island. Check local weather for wind direction and speed. From boat ramp head west out of harbor and then head south (left). There are several coves to explore along the way, but the main channel is marked with red and green channel markers. Follow these to the mouth of San Domingo Creek. At the red channel marker #4, look to your right to locate Hambleton Island. Paddle around Hambleton Island and retrace your path to the put-in. Attractions: Note the several colonial homes along the shoreline of San Domingo Creek. At the #4 channel marker, explore the left shoreline (east) to see submerged grasses if the water clarity allows. These underwater grasses provide habitat and food for many aquatic organisms. Some of the grasses have been restored to the area through a University of Maryland research project. Make your way back across San Domingo Creek to Hambleton Island. These islands were once one island, but are now eroding and have split. Again look for underwater grasses in the shallows around the islands and visit the small sandy beach on the west side at low tide. Directions to launch site: From Route 33 in St. Michaels take E. Chew Avenue and proceed 2 blocks to harbor on left. There are two boat ramps in the harbor. Hard put-in. Attractions: St. Michaels harbor has many attractions to be viewed from the water. Once out in the Miles River, watch watermen fish for crabs and clams. The embayment’s eastern shoreline hosts farm fields buffered by small red cedars and other trees and grasses. Birdlife you are likely to encounter include Osprey, Great Blue Heron, Eagles, and Swans. You may also encounter turtles and muskrats. Skill level: Intermediate to difficult, open waters with NW to SW exposure. Cautions: Be aware of tidal currents. Waves 1-2 feet or higher in strong winds. Return trip can be against SW winds, especially in summer. Check local weather for wind direction and speed. Motorized boat traffic can be high during the summer and stay clear of all commercial boat traffic. From boat ramp head west (right). Before exiting the harbor, you may want to tour around to view the various businesses, restaurants and inns from the water. From the harbor head north (right) into the Miles River. Turn east (right) and follow developed southern shoreline for 1.25 miles to Spencer Creek to the SE (right). 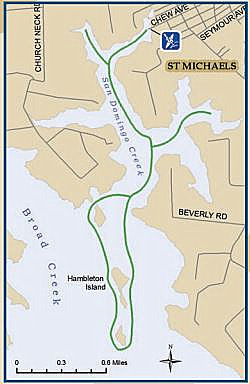 Explore the creek and retrace your path to the harbor and boat ramp. Directions to launch sites for A & B: From St. Michaels take Route 33 toward Easton to the Oak Creek Bridge. Just before the bridge, turn right on Station Road and turn left into the parking lot. Boat ramp launch is at the end of parking lot. Hard put-in. Skill level: Beginner to intermediate, easy paddle, protected waters. Cautions: Be aware of tidal currents. From boat ramp head south (right and away from bridge on your left) and stay to the right at fork in creek. The Oaks, a long-time Eastern Shore Inn, is located 0.7 miles from boat ramp up the right fork of Oak Creek. Paddle back along the right fork and head SE along the left fork. Return via the eastern shoreline to boat ramp. Attractions: The shoreline of Oak Creek is lined by many older Talbot County homes and estates. Shoreline is a mix of rip-rap (stone breakwater) and wooded edges. The calm waters provide excellent viewing of Osprey fishing for their dinner. You can see resident Canada Geese nests and Great Blue Herons wading in the shallows. Blue Crab fishing boats and clamming boats operate from the moor. Cautions: Be aware of tidal currents. Waves 1-2 feet or higher in strong winds. Return trip can be against SW winds, especially in summer. Check local weather for wind direction and speed. Please stay clear of all commercial boating traffic. From boat ramp head north (left) and pass under Oak Creek Bridge. Stay on the eastern shoreline (right) for about 0.5 miles and enter Newcomb Creek. There is an island at the mouth of the creek and a shallow area on the N side of the opening. Follow creek to right along the developed shoreline. The creek ends in a pond area with a fringing marsh dominated by salt marsh cordgrass (Spartina alternifloria) and marsh elder (Iva frutescens). Retrace your path to boat ramp. Attractions: Watermen work on the Miles River, fishing for clams and crabs. During colder months, Sea Ducks (Bufflehead, Old Squaw, Canvasbacks) float in the open waters of the Miles. During the summer you may see log canoes, skipjacks, sailboats, and other vessels in the river.